It is a gigantic transition from the one-too-many, “yell-and-sell” style campaigns to one-on-one, “chat-and-connect” conversations. The modern opportunity is to build an ongoing, personal, deep relationship with the individual customer. At the same time, marketers must be more deliberate, since it is so much harder to fake a relationship than it is with a transient ad or marketing message. Today a brand must become an assistant, friend, adviser, and guide. These conversational interactions are far more substantial and consequential. Brands now must be much more personal. Instead of broad, high-level key messages, each brand must now communicate highly individualized messages. What value can I bring this particular customer? Instead of having the customer herself map the brand messages to their personal situation, the brand has to map its individual offers to the customer’s personal, ever-evolving situation. That means brands will also need to remember prior conversations and maintain context in all future conversations since it is terribly frustrating for the user to repeat already-provided context. Outbound notifications, or push messages, will be transformed from the simple alert (that are an end in themselves) to the interactive message that is the start of a new conversation! Instead of receiving an alert notifying me of my package delivery, I prefer it includes an innate ability to instantly reschedule. Instead of an alert just confirming my flight ticket, I might like to view destination information at the same time. No message will be standalone; each message will operate in conjunction with a rich, conversational experience. Even the frequency and timing of messages will be influenced by user preference and context. Nothing will ever be the same. These conversational experiences will transform engagement marketing. We all know that drip marketing and newsletters start feeling like spam after a while. Now, personally relevant messages sent at the time and frequency of a user’s choice will likely have a better response. A short message is nowhere near as disruptive as long-form emails are, and by interacting with these short messages the user can dig deeper at their own convenience. In fact, conversations are proving to drive conversions. A rich, engaging, meaningful conversation catered to the user’s needs is more likely to convert to the transaction or, at the very least, identify a lead. Conversations offer brands a chance to fully understand customer requirements and to position their products just right. This is similar to offline retail where a good shopping assistant can convert customers and upsell or cross-sell products, while an overly aggressive salesperson will likely drive customers away. Whether your brand appears to be a friendly shopping assistant or a used-car salesman will now determine your conversion rate. 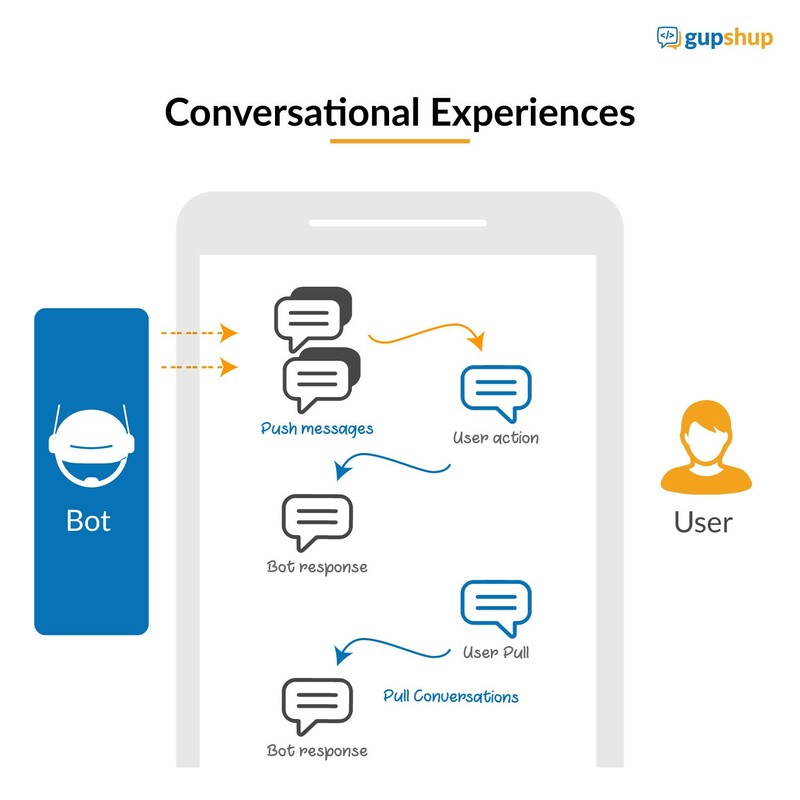 At Gupshup, we’re busy building tools for bot-enabled conversational experiences spanning marketing, commerce and support across a variety of messaging channels. AI-powered bots are bound to become the new marketer. Chatbots enable conversational experiences that engage with customers without being intrusive. They are personal and fully understand a customer’s needs and preferences, and will build long-lasting relationships with customers by offering the right product to the right customer in the right way. Welcome to the exciting new world of conversational marketing.